Whilst today’s popular music world seems to be based around the idea of “style over substance”, Scottish Hard Rock Trio, The Amorettes, have a very simple plan; Taking over the world, one show at a time! No fuss! No gimmicks! Just good, old-fashioned hard work, and great songs. Anyone who’s ever experienced an Amorettes live show can easily testify to the buzz of expectation that kicks in as soon the lights go down, and the intro rolls. Never has the Slade track, We’ll bring the house down been so prophetic in its meaning. The roar from the crowd builds expectation from the very start, and the energy and intensity doesn’t let up until we reach the end together. It’s not just all down to Montgomery though, Drummer Hannah McKay, who is considered to be one of the best young, drummers on the music scene today, uses her full kit to deliver knock-out blows to each and every member of the audience. Try and hide as much as you like, there is no escape from her drumming fury. Likewise, Bass player Heather McKay is a sight to behold on stage, banging out her rock-solid rhythms whilst prowling the stage like a Tiger, her long hair flailing in the lights as her head does not stop moving even for a second. Having what is arguably the tightest rhythm section on today’s rock scene behind her allows Montgomery to showcase her powerful vocals whilst also tearing off riff after riff, and solo after solo with ease. 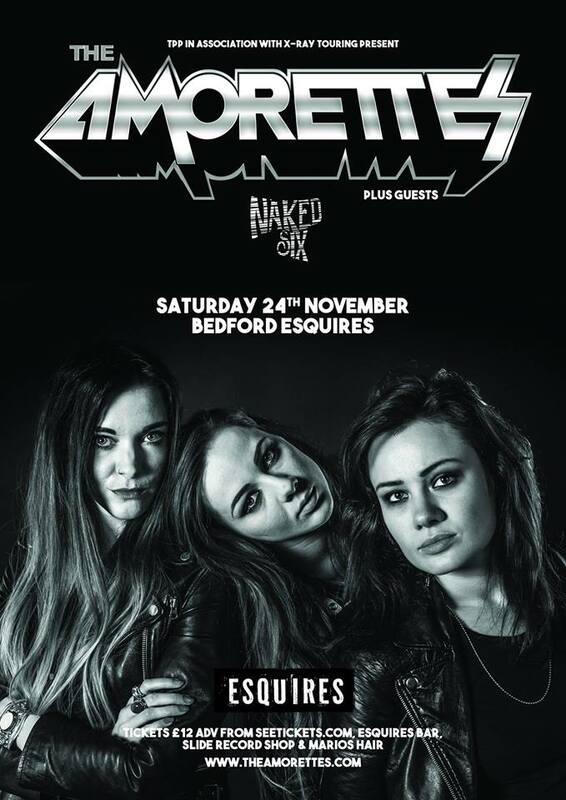 Relentless touring across the UK and Europe has turned The Amorettes into a lean, mean, Rock and Roll machine, leading them to be described as “Like Airbourne fronted by Joan Jett”. Reviews for both live shows, and the albums, only reinforce the fact that The Amorettes star is still very much in ascendance, and, as long as there are stages to play, and records to make, there is no sign of this “Female Motorhead” attempting to take the easy road to the top.